It was not in an opera by Verdi or Puccini that Plácido Domingo made his major and decisive breakthrough in New York, in 1966 at the age of 25. It was in fact in a work by the Argentinian composer Alberto Ginastera (1916-1983), whose centenary is celebrated with this album of operatic excerpts and concert music for voice. 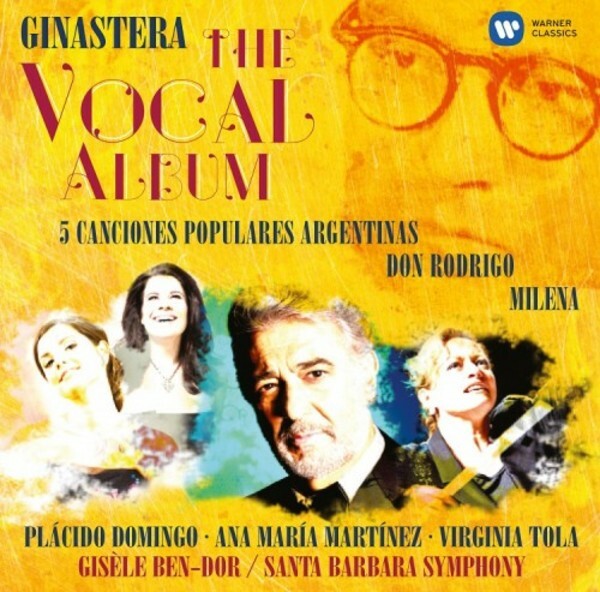 The performers on Ginastera – The Vocal Album are Domingo, the sopranos Ana-Maria Martínez and Virginia Tola (both past prizewinners in Domingo’s Operalia competition) and California’s Santa Barbara Symphony under its conductor laureate, Gisèle Ben-Dor. She is a native of Uruguay, one of Argentina’s closest neighbours, and a notable champion of Latin American music. In 2004 – in collaboration with Ginastera’s daughter Georgina – she staged the Tango and Malambo Festival in Santa Barbara. If Don Rodrigo can be classified musically as a piece of atonal expressionism, the Cinco Canciones Populares Argentinas, dating from some 20 years earlier and written as a response to political turmoil in Argentina, draw directly on the country’s folk music and are full of Latin colours and inflections. Ana-Maria Martínez, born in Puerto Rico, lends her rich and mellow vocal texture to their evocative lines. The Old World is the focus of the dramatic cantata Milena, composed in 1971 and performed with characteristic intensity by Virginia Tola, who is from Argentina. The cantata’s text is a Spanish translation of letters that Frank Kafka wrote (in German) to Milena Jesenská, who was the first person to translate his work into Czech. Kafka and Jesenská – who was married – met only twice, but, in the course of 1919 and 1920, they conducted an intense relationship via correspondence. The cantata, which makes use of both sung and spoken text, is composed in an uncompromisingly modern style, but includes a haunting musical quotation from ‘Der Leiermann’, the concluding song of Schubert’s gloomy song cycle Winterreise. Fifteen years in the making, this exceptionally rewarding disc is a tribute to the dedication and musicality of its conductor, the Latin American music specialist Gisèle Ben-Dor. She has already made several important recordings of Ginastera’s music with the Santa Barbara Symphony, but this is the most enterprising and illuminating yet. The most immediately accessible work here - the Cinco canciones populares Argentinas (1935) – is appropriately placed first. Dating from Ginastera’s first, ‘objective nationalist’ period (his own description), it draws on popular Argentine idioms and musical flavours, spiced up with subtle harmonic tweaks. This, however, is not the Argentina of the gauchos so familiar from Ginastera’s other early works, but a series of traditional-style songs ranging from the lively and flirtatious to the warm and tender. The opening Charcarera is deliciously inflected by soprano Ana María Martínez and the orchestra, while Ben-Dor highlights the eery delicacy of the outer sections in the lullaby Arrorró as well as the Bartókian echos of its middle section. The final song, Gato, swings along delightfully, and Shimon Cohen’s orchestrations (specially commissioned by Ben-Dor) are splendidly idiomatic. Just how fine an orchestrator Ginastera himself was emerges with brilliant clarity in the other pieces on the disc: two scenes from his first opera, Don Rodrigo (1964), and the cantata Milena for soprano and orchestra (1971). Both works are from the composer’s third, ‘neo-Expressionist’ period, employing aleatoric and serial techniques, and even extended and microtonal techniques in the latter. Though more demanding of the listener, at least on first acquaintance, they are unusually compelling, exuding a rare compositional confidence. Like Ginastera’s two subsequent operas, Don Rodrigo has an historic setting, in this case the story/legend of Roderic, the last Visigothic king of Spain. Structured symmetrically, the opera tells the tale of Rodrigo’s rise, sin and downfall, and the two scenes recorded here are the central crisis in which he rapes his female charge, Florinda, and her final redemption of him as all the bells of Spain miraculously ring out at his death. This was the work that, at its US premiere in 1966, gave the young Plácido Domingo his breakthrough in the title role, and here, fifty years on, he returns to it in style. Though he and soprano Virginia Tola recorded their music separately, this is a performance of huge commitment, emphasising the Berg-like beauties of the score as much as its Expressionistic darkness. The climax, with over a dozen different types of bell ringing out, is deeply moving and, with no complete recording in existence, this is required listening for anyone wanting to know the opera. Even more gripping is the cantata Milena. Based on fragments from Franz Kafka’s Letters to Milena, it charts the writer’s brief, intense affair with a younger Czech author, Milena Jesenská. Just as the letters themselves range from the touching to the nightmarish, so the array of sonorities used by Ginastera is dazzling, with prominent percussion, stunning transitions (such as the way the singer’s final note dissolves into the violin line that opens Cantus I), and brilliant setting of the spoken word in the haunting Prosa movements. In the Cantus Finalis - effectively Kafka’s farewell - Ginastera incorporates spectral strands from Der Leiermann, the closing movement of Schubert’s Winterreise, to devastating effect. Virginia Tola surpasses herself here, and the contribution of the Santa Barbara players is in the same superb class, with some of the most striking purely orchestral textures you’re ever likely to hear. If you’re looking for a disc with which to mark Ginastera’s centenary year, this is by far the most interesting you’ll find, a fascinating and imaginative coupling of the popular and the rare. Unmissable from start to finish.